The event is over. Biolos talked story and ended up taking 28 or so custom board orders during a stormy winter day. People got to pick his brain on board design and watch the Snapper WCT all in one afternoon thanks the big screen the Clairemont crew set up in the shop. Thanks to CLAIREMONT SURF SHOP for the great time. Here’s a few photos from the event but there’s more coming very soon. A replica of Mason Ho’s signature traction pad. Lucky Bastards resin tint board. Cork deck. Yes like a wine cork. Clairemont customer gets a custom order. Wardo hasn’t filled out one of these in a while. …Lost surfboards team guy Rick Downes helps pick out the logos. Just like for all the team guys. Two Taj and one Kolohe “Exacta” models. “Cork is very light and you don’t even need wax”. Biolos showing off one of the new C3 (Carbon Cork Composite) Weekend Warrior surfboards. We make other kinds of boards too. Bigfoot stoked on his custom ordered board from Mayhem. The under belly of an RV. Mayhem designing boards on CAD. 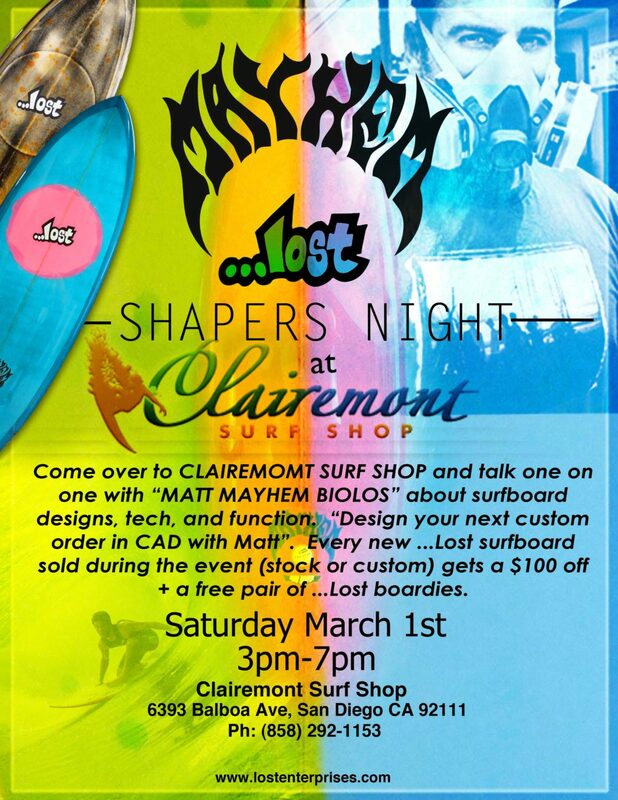 Saturday, March 1st from 3-7 PM come over to CLAIREMONT SURF SHOP and talk one on one with Matt “Mayhem” Biolos about surfboard design, tech and function. Design your next custom order in CAD with Matt. Every …Lost surfboard sold during the event (stock or custom) gets $100 off + a free boardshorts.